We had a great opening weekend here at Cranmore! After a fantastic Thanksgivings Day weekend or skiing, riding and having fun in the Mountain Adventure Park, there are still plenty of good things to look forward to. Looking forward to a cold, snowy winter is most certainly on the minds of every skier and rider. The weather forecast ahead looks cold which means we will be making snow as much as humanely possible. Currently our snowmakers are blowing the goods on trails such as Easy Street, Gibson, Lower Gibson, Beginner’s Luck, Lucky Pitch, Snow Train, the South Slope and the Beginner Basin Area. Expect to see more trails and lifts open for the weekend of Saturday December 1st. The new Schneider Triple Chair is also something that skiers and riders should be very anxious for. The Schneider Triple Chair is replacing the old East Chair which had run every winter since the 1950’s; it was definitely out dated. Skiers and riders are going to love the extra 300 feet of vertical that the Schneider Triple Chair will provide as well as being able to access twice as many runs as opposed to what could be accessed on the old rickety East Chair. Many of the final touches are being finished, all of the lift towers have recently been installed and the cross arms are being attached. The Schneider Triple Chair will make its official Cranmore debut in late December. Don’t miss your opportunity to be one of the first people to take a ride up and stay tuned for its opening date. Let the snow rituals begin. Since November 5th we have been firing up the snowguns any chance we get, as we push towards our projected opening date of Friday November 23rd. In the offseason we added 60 high energy efficient snowguns to our arsenal which now brings our grand total to 378. 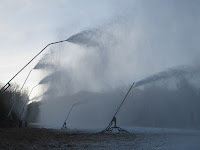 The 250,000 dollar investment in the new snowmaking equipment will greatly help us lay down a great foundation of snow. But let’s be honest we can make all the snow that we want, but there is something about natural snow that is just fantastic. There is the anticipation of a major Nor’Easter rolling in, and the excitement of seeing the landscape outside freshly coated with new snow. There is the sheer joy that comes with a powder day and the stories that last a lifetime. To put it simply we live for snow, and lots of it as skiers and riders. A skier enjoying Ullr's gifts. As many of us know by living on the East Coast, Ullr the snow god sometimes doesn’t treat us the way we would like or he pays too much attention to our friends to the West. But once in a great while he looks down and delivers the goods to the land that we most certainly cherish. But there are plenty of things we can do to help our cause. 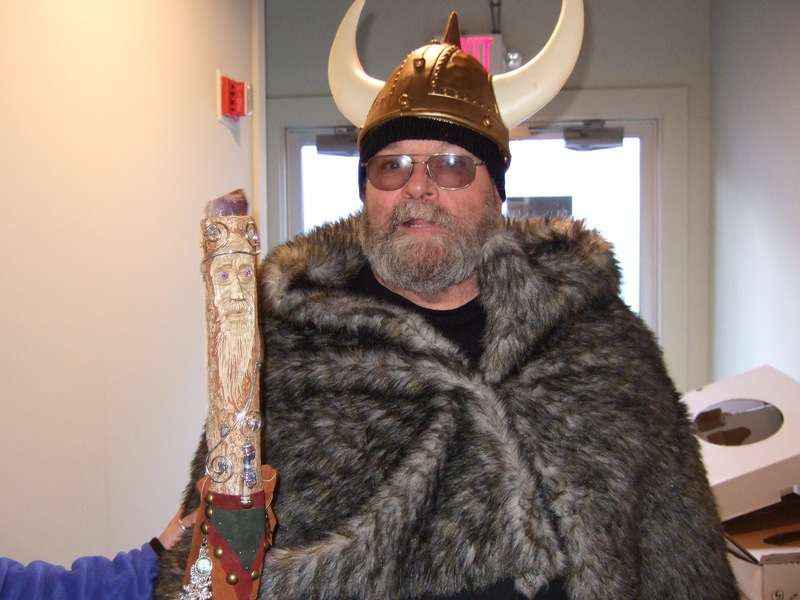 Ullr is a stubborn, fickle man, and we have to do everything in our power to please him. Urban legend has it that Ullr is a huge fan of snow rituals and superstitions. There are so many of them, that any of us can perform them, and most of them don’t require that much effort. For those who want it to dump every single day of the year and never see summer again this is the ritual that may be right up your alley. Gather as many of your skiing and riding buddies as you can. Start a bonfire the size of Rhode Island and throw old equipment into the fire. Burning old straight skis and neon colored snowboards will show Ullr that you are willing to part with the past and are ready for any storm that he can dish out in the future. Before throwing the skis and snowboards into the blaze, circling around the fire chanting skiing and riding terminology with your equipment high above your head can’t hurt your cause either. For those who want to be more civil than barbaric, some of the best rituals are ones that take us back to days in Elementary school. Wear your pajamas inside out before tucking yourself into bed. Not into wearing your pajamas inside out? Try this one out. You’ll have to break into the piggy bank and take out all of the pennies and stack them as high as you can on the windowsill. Do this when a storm is heading towards North Conway, supposedly the more pennies you have the more snow that will fall from the snowstorm. The list goes on and on with snow rituals, too many of them to mention in this blog. Take a look online for other rituals and get out there and do your part. Cranmore needs your help, your fellow brethren of snow needs your help. Start your snow rituals today! The start of the season is almost here. Some of Cranmore's new snow guns. The calendar has now hit November and we are closer than ever to our projected opening date which is November 23rd (weather dependent). According to the head of snowmaking there looks like there is a window of opportunity to make some snow quite soon. This year Cranmore has invested $250,000 into 60 new energy efficient snow guns which brings Cranmore’s arsenal to 378. As soon as cold temperatures roll in, Cranmore snowmakers are ready to push the button and start blasting the white stuff. But it’s not only cold temperatures which are imperative to making snow…low humidity is also key. The brains behind Cranmore’s snowmaking keep their eyes on what is called the wet bulb temperature. The wet bulb is a combination of air temperature and the humidity. As the temperatures and humidity drop, the amount of snow that Cranmore can make in an hour, increases. 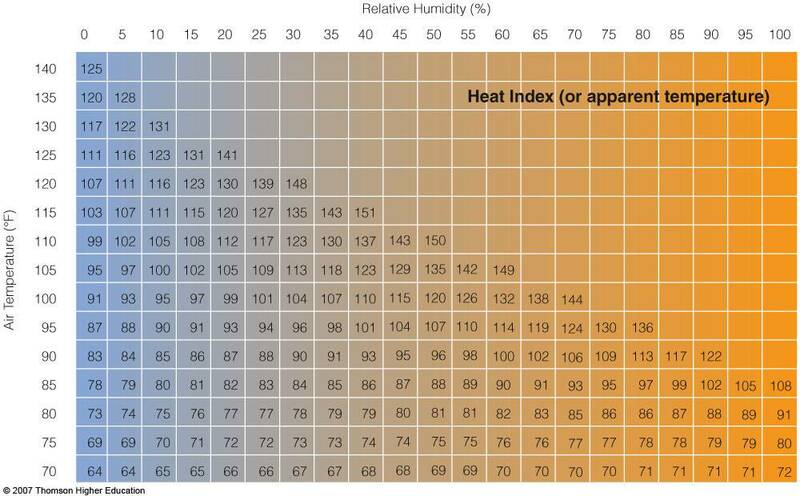 Check out a wet bulb chart here (http://apollo.lsc.vsc.edu/classes/met130/notes/chapter4/graphics/wet_bulb.jpg). 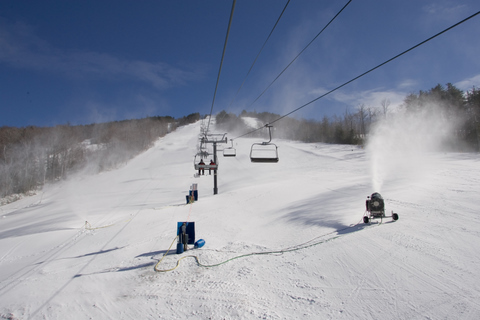 Cold temperatures are the main ingredient in making snow. Without cold weather, our equipment, no matter how advanced, might as well be “puking snow” as it is said in the ski industry. At 32 degrees Fahrenheit, water is able to turn into snow crystals, but ideal temperatures fall at 28 degrees or lower. Ideal snowmaking conditions are with a wet bulb in the low 20’s with temperatures of or 28 or lower. Recent work on a snowmaking pipe. Miles and miles of snowmaking pipe trace Cranmore’s trails, flowing with water, and in a parallel pipe, air. Water is drawn from the snowmaking retention pond (which holds 1.2 million gallons of water when full) at the base of the learning area. As the snow melts, the water is returned back to the pond to await another season of snowmaking. Cranmore’s snowmaking system is able to pump up to 3,000 gallons of water a minute, and 14,000 cubic feet of air. Water is taken from the pond, travels through the pump house, travels through the pipe, and then is disbursed through the guns. This will be happening real soon. Cold temperatures are right around the corner and the snow guns will fire as soon as the temperatures go below freezing. Even though we can cover trails in the blink of an eye with our snowmaking system we never hate a little assistance from Mother Nature. Start praying to Ullr the snow god and start your snow dances. Old Man Winter is on his way to North Conway real soon. Continue to call our snowphone 1-800-SUN-N-SKI, and check Cranmore’s snow report page for the most to date information.